A well presented mid-terraced family villa, No 6 Whiteside Terrace is located within a popular residential location close to local transport links & schools. The property has been freshened up with new floor coverings throughout & most apartments being newly decorated. The accommodation on offer extends to entrance hallway, lounge with feature fireplace, kitchen dining room the kitchen with older style wall & base units & door to south-west facing rear garden. On the upper floor there are three bedrooms & bathroom with white three piece suite. Warmed by gas central heating with Vokera combi-boiler installed circa 2013 the property also benefits from having good quality double glazed windows & doors and a low maintenance South-West facing rear garden & front garden with potential to accommodate driveway. 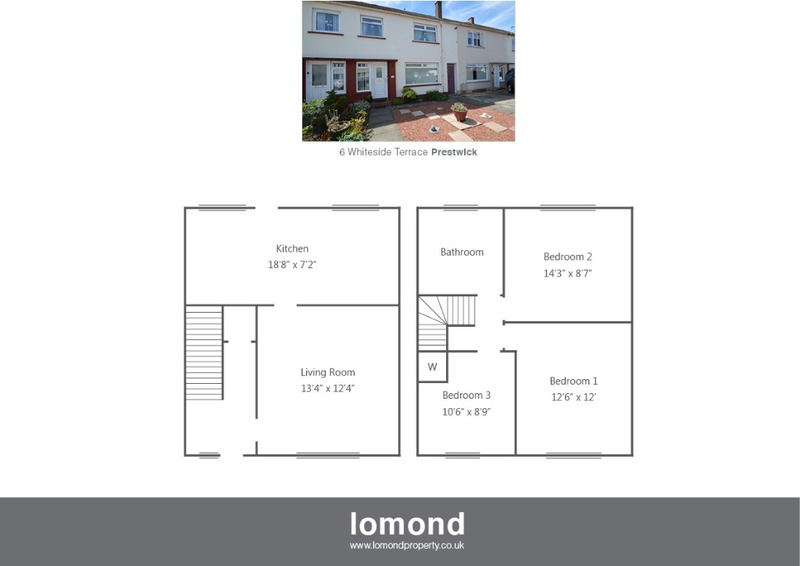 The property is located within an established residential area with similar types of properties and is conveniently located in relation to a typical range of local facilities and amenities including, shops and bus routes. From Prestwick Main Street continue south on Main Street turning onto St Quivox Road, at staggered junction continue St Quivox Road passing the Spar shop on your right (at East Road) following the road as it takes a left then take the first right onto Rowanbank Road then right to Whiteside Road then left for Whiteside Terrace where the property is on your right.